In tribute to my three years of living in Hyde Park on the south side of Chicago, I am having a favorite things week. You can thank me later. An old and dear friend visited me this past summer. This friend and I became acquainted thirty-two summers ago and we were inseparable for years. Katie Scarlett O'Hara Hamilton Kennedy Butler and I. 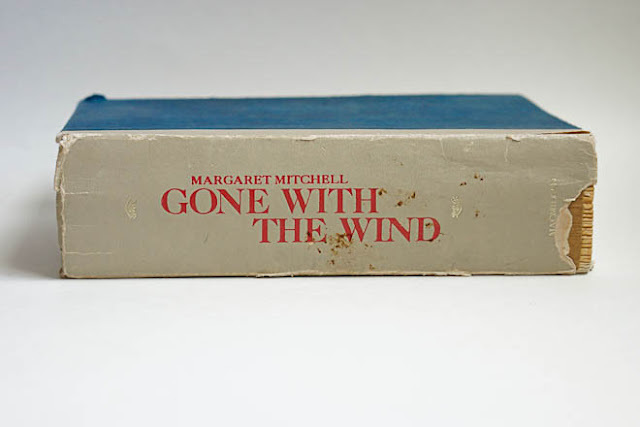 Desperate for something to read, I pulled Gone with the Wind off my family's bookshelf for the first time when I was almost eleven years old. I don't remember what motivated me to take this journey--I'm sure my mom had somehow directed my choice--but I do remember the exact script used on the binding and the exact color blue of its cover. I was undaunted by its size; knowing me, I'm sure I saw its 739 pages as a mountain to conquer with a badge of honor to wear with pride at completion. Little did I know that I would find in its pages a kindred spirit to which I would return so many times that I memorized page numbers of my favorite chapters (the library at Twelve Oaks, the bazaar in Atlanta, the makeshift jail at the train depot, the long-anticipated marriage proposal in the parlor, the back yard pony accident); in fact, Mom's my copy became so dog-eared from traveling in my book bag or under my arm that the binding broke down in those well-read locations to the point that sections of story loosened and eventually fell out. What drew me to this antebellum world? Like Scarlett, I was passionate and feisty and determined. I also felt the pangs of unrequited or unfulfilled love--powerful emotions in the young and naive. I, too, spoke my mind, to the annoyance of those trying to teach me the manners of society, but unlike her, I lived in the boring world of modernity. I longed for the suitors and the balls and the mansions and the dresses! The dresses with their endless yards of lace and ribbon and fabric captured my romantic heart. Two summers after my love affair with GWTW began, Mom found a 50s-era hoop slip at a garage sale, and she made me a skirt to fit over it--a floral print skirt in soft greens and muted yellows worthy of Scarlett O'Hara herself. I was almost thirteen that summer, and all it took to transport me from boring Twin Falls, Idaho, to war-torn Georgia would be my overactive imagination and slipping into that skirt and a pair of ballet slippers. I was Scarlett O'Hara as I delicately tiptoed from one stepping stone to another in our backyard with my skirts swaying and mind racing from one scene in the book to the next, running from Yankees with helpless family in the back of a rickety wagon or prancing down the streets of New Orleans with dashing Rhett Butler on my arm. How I wish there was a picture of me from those days. Years passed and I entered a modern universe parallel to the 1860s. I captured the heart of my first love and lost it. I attended dances in dresses designed to my specifications and danced and danced and dreamed. Throughout those high school years I would return again and again to Scarlett's world, relishing the familiar details of her life each time I opened the book. How many times I read it I can't even calculate. And then, I grew up. First a husband, then children came one by one by one. We moved and moved and moved again, and each time my precious copy of Gone With The Wind would move with us, its loosened pages and torn binding lovingly restacked in order, then placed in a spot of honor on my shelf. In a fit of madness, I found a new copy for a dollar and replaced my worn copy with this pristine one--a different edition with a different typeface and different page numbers. I read it a few times, but something just wasn't right. It didn't feel right. It didn't open right. It didn't read right. Things between me and Scarlett were never the same again. I began to think that my love for her world was simply part of my childhood--something I had outgrown, almost a joke. I mean, who dresses up in hoopskirts and fantasizes about mustachioed men? Certainly not me. Last summer, I had the once-in-a-lifetime opportunity to drive across the country to Wyalusing, PA, with my four youngest children--Our Grand Adventure. As a definite nod to my past, I decided that detouring through Atlanta would add only four or five hours to our drive, so why not stop? And if I was going to stop in Scarlett's homeland, I might as well dust off my copy of Gone With The Wind and reintroduce myself, right? I packed it in my overnight bag and began reading it on the first night of our journey. From the first pages detailing Scarlett's flirtatious conversation with the Tarleton twins, I was hooked again--hooked in a way I never expected and in a way I had never experienced before. Margaret Mitchell's writing enveloped me in Scarlett's world. I could smell the red Georgia clay in my hands. I could feel the tightening stays around my waist. I could smell the barbecue wafting from the slave quarters at Twelve Oaks. I could see the Yankee soldier intruding upon Tara's sacred soil and feel the fear that blanketed the South during Reconstruction. I fell in love not with the story but with the words--how the words flowed together seamlessly and beautifully and lovingly, detailing a world that will never live again. I appreciated Gone With The Wind from a literary perspective--unlike most current fictional heroines, Scarlett will live on like Thackeray's Becky in Vanity Fair or Cathy in Bronte's Wuthering Heights. This was great literature, and my romantic teenage mind had completely missed that fact. This newfound appreciation for its literary value wasn't my only surprise. I discovered that after years away from the familiar Ashley/Scarlett/Rhett triangle with the loving Melanie always in the background, I knew these characters in ways that I can only inadequately explain. For the first time, I grasped how deeply Rhett loved Scarlett and why. I recognized his love for her in small gestures--his indulgent smile, his eyes searching her face before he restored his mask of indifference. I understood Scarlett's fiery nature and deep-seeded need to always be safe, despite the fact that her safety came from the devotion of her husband, not from her bottomless bank account. I appreciated Melanie as the strong, unwavering pillar I had always overlooked in my childish obsession with the willful Scarlett. Most surprising of all, I agreed with Rhett when he walked out the door forever, uttering some of the most famous words in literature or cinema, "My dear, I don't give a damn." These were my people. My story. Why had I been away so long? This post is dedicated to my mother--who transformed me into Scarlett, who allowed my imagination to run free, and who encouraged me to write about it. And I will argue vehemently all the live-long day with anyone who tries to tell me Scarlett is a "dumb" character, namely my roommate. I had seen the movie countless times but I picked up this book in 10th grade read it in 2 days, at school, and completely ignored whatever was being taught in classes both days. It became one of my favorites. I tried to read the sequel, written by someone else, and she failed to really understand Katie Scarlett. I was so disappointed. it was the first time I realized the book is almost alway better than the movie and I loved the movie - I loved the book more! Maybe I will pull out my copy and have a reread too. I read the book at age twelve, so I had the same dreams as you did at that age, so I understood what you might be feeling. It was fun for me to see those feelings in you. It mattered even more to you than to me and your love for the story still delights me.